From the sleeve: Boing Being were a label from Finland, based in the impressively named Korkeakoski which looks, from Google Maps, like quite a small place. From insert number one: Space Rocket are a free jazz/noise band, and have members with names including Hjalmar Uitto, Man As A Lamb, George Webber, Sonny Cheeba and Timothy Z. Lapland. I suspect some of those names may not be real. From insert number two (a very nice-looking insert, printed in silver ink on blue stock): No idea. 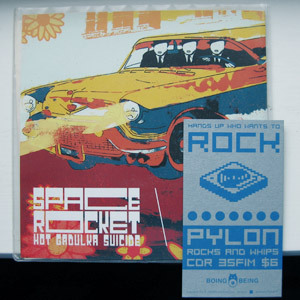 The text on the insert reads ‘Hands up who wants to rock / Pylon / Rocks And Whips / CDR 35FIM $6’. What does this mean? From insert number three: Boing Being also released comics, such as the one advertised on this insert, Glömp4, which looks to be a selection of Finnish artists. From the disc itself (which is beautiful salmon pink vinyl): Boing Being have a keen eye for nicely-designed things, such as in this record’s label design which has some elegantly-spaced, minimalist typography. Boing Being are still an operational label, as their website confirms, and look! They’re now up to a tenth issue of Glömp as well as having around 30 musical releases under their belt as well. It’s always heartening to see independent labels lasting for years and getting better and better. Nice crazed-looking website they’ve got there, too! *Having now looked at the Boing Being website, and the list of previous releases, my detective skills may have paid off: they released a few things by Warser Gate in the past, a member of whom I used to be in regular contact with. His name was Kev. Maybe Kev sent me this record as a little gift? If so – thanks, Kev!